Join us for Ecumenical Holy Week Services in Needham and for Easter Sunday at our regular worship time, 10am, in the sanctuary. For more information and service times and locations, visit our Facebook Page https://www.facebook.com/FirstBaptistNeedham/, or go to the Home page of our website. We regularly gather for worship on Sunday mornings at 10am in our sanctuary to offer praise, glory, and thanksgiving to God, to discern the Word and will of God in community and through the scriptures, and to open our hearts to a Spirit-filled word from our preacher of the day. We delight in congregational singing and, from time to time, in the special music offerings of local performing artists as well as our own congregational talents. Our worship style on Sunday mornings is traditional and follows the liturgical calendar for most of the year. One way that our community holds one another in our joys and concerns is through prayer. If you have joys and concerns you would like us to hold and remember during worship, we invite you to join us on Sunday mornings for Prayers of the People, or you can contact our pastoral staff and they will bring your prayers to the community. In addition to Sunday morning worship, our community offers ecumenical and interfaith opportunities for worship: Holy Week services with other churches in Needham, a Blue Christmas Service, and the annual Interfaith Thanksgiving Service (hosted by our church in 2016). We look forward to seeing you in worship! 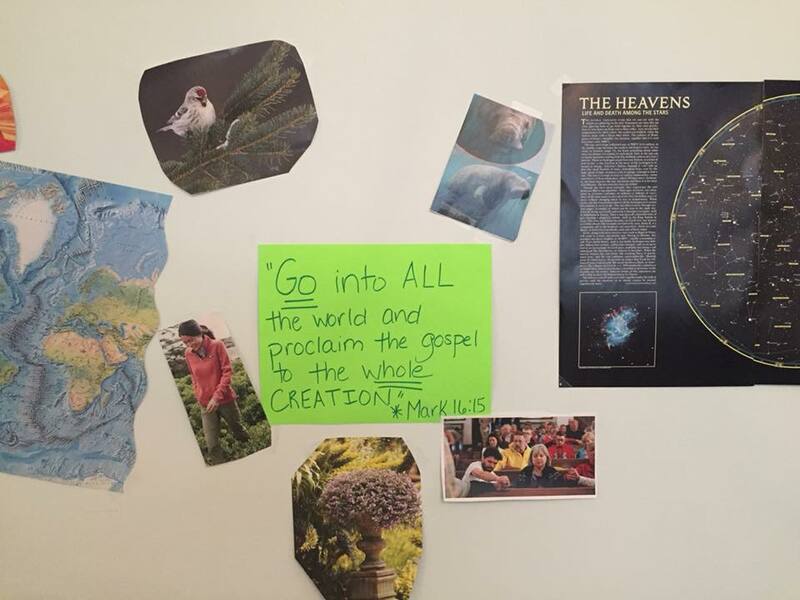 Each summer our church hosts a free Vacation Bible School for children and youth. The campers range in age from 4 years to high school seniors. Older campers have the opportunity to serve as helpers throughout the week. For the past four years, the curriculum has been written by Pastor Daryn and friends, and always emphasizes God's love and grace for the world, our call to love and serve our neighbors as ourselves, and our responsibility as stewards of this earth and of all God's good creation. Through creative activities and art, engaging Bible lessons, music and play, and thoughtful and educational instruction, this Vacation Bible School aims to strengthen campers and staff spiritually, emotionally, and intellectually. For the past three years of VBS, we have collaborated with Creation Care Ministries of The American Baptist Churches of Massachusetts. Creation Care Coordinator, Kristina Keefe-Perry, helps remind the campers of our eco obligations to our planet. We are so blessed to have her with us each summer! We are planning right now for VACATION BIBLE SCHOOL 2019, August 26-30! Check back with us soon for more information. In 2018 our theme was "Cultivating Care"! We explored the theme of caring through a variety of lenses: for our world, our families, our neighbors, ourselves, and God. Each way of caring was explored Biblically and given relevance for the campers' own lived experiences. As we heard the stories of The Good Samaritan and the foot washing of Jesus, we engaged in acts of service to our neighbors and community. Among other caring endeavors, we collected eight boxes of school supplies for a sister church in Puerto Rico whose school community continues to recover from Hurricane Maria's devastation. We also planted a meditation and prayer garden near the church's West Wing door to be enjoyed by our Needham neighbors (a huge shout out to Hillcrest Gardens in Needham for their generous assistance and support with this project). Christine Shrade-Keddy joined our VBS 2018 team. Christine is the Associate Pastor of Family Education and Outreach at First Baptist Church in Westwood, and TABCOM’s Elder Care Ministry Coordinator. Christine has offered her wisdom and gifts as an educator in writing and coordinating the curriculum and activities for the week. Thank you, Christine, for sharing your gifts with us! We are looking forward to another meaningful and formative week together at Vacation Bible School in 2019! Check back for more information. Packing boxes of school supplies for our neighbors in Puerto Rico. Blessing our boxes of supplies and praying for our neighbors. Off they go! Our blessings of care are on their way. Hillcrest Garden helped us plant a beautiful prayer and meditation garden for our neighbors in Needham to enjoy. One of our scriptures for the week. All of creation needs to hear and experience good news. We can bring good news to others and all of creation through our care and concern for them.